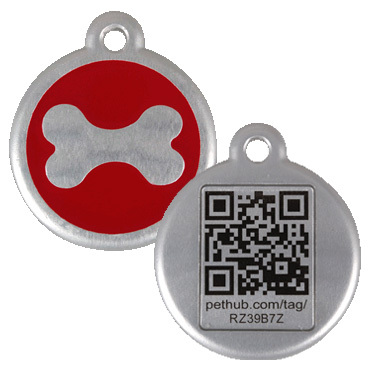 This QR dog tag by Red Dingo in red bone design makes use of the latest code technology and is powered by PetHub. 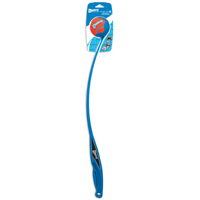 Protect your dog with more than just a phone number on a tag and make updating tag information instant and easier than ever before. 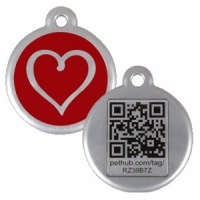 Red Dingo has incorporated QR (Quick Response) codes into these special tags to enable more information to be given to the finder of a lost dog. QR codes work on a similar principle to barcodes but can be read by anyone with a smartphone or similar internet enabled mobile device. Simply scan the QR coded tag to access the pet's information or use the given web address to view the pet's own personal webpage containing all their details. This additional information can make it quicker and easier to reunite a lost dog with its owner. 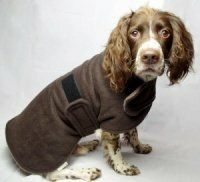 Your dog's details are stored on PetHub's secure webspace. The QR tag can be updated as often as you like, instantly. Simply log in online and make the required changes. Add as much or as little information as you want *. Include your contact details and you may also want to include vet contact details, medication and allergy information, dietary requirements, a photo and description of your dog plus any other information that you feel is important for others to know about should they find your pet. 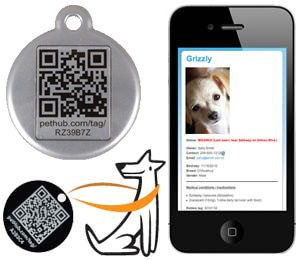 You even receive notification if your pet's QR tag is scanned. Updating dog tag information has never been easier or quicker. If you move house, changed phone number or have important information to add about your dog, simply update your pet's online profile and their tag is instantly updated. Even if you go away with your dog you can temporarily change the contact details to that of your holiday accommodation, or change to a friend or relative's contact details for the duration that they are looking after your pet. These QR dog tags, like all Red Dingo products, are strength and safety tested to the highest quality standard.